Traders Update: Market Crash Imminent? Hi Folks, Just another update. I am still bearish on the market. I believe the selloff begins before the end of the year. Chart wise, the end of September looks particularly bad. It looks as though something bad is going to happen. Maybe terrorism? I really think people need to protect their portfolios going into the next few years. Since my last post the market has traded sideways allowing the moving averages to catch up so the stage is set for a potentially massive sell off. 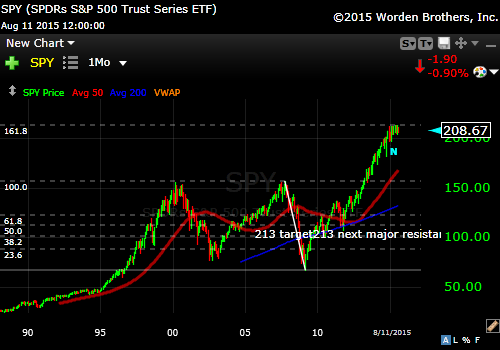 One possibility based on Fibonacci's is an 80% correction. Ouch!! Below is a chart with the Fibonacci drawn on it from the 2007 high to the 2009 bottom. You can see the market hit the 161.8 on the button.